Denny Hamlin finished 34th in Sunday’s NASCAR Sprint Cup Series race at Watkins Glen (N.Y.) International, suffering a blown engine in the #11 FedEx Freight Toyota after 57 of 90 laps at the 2.4-mile road course event won by Marcos Ambrose. Hamlin started 23rd and steadily worked his way up through the field in the opening 30-lap stint. The team was hoping to make the scheduled distance in just two pit stops, and crew chief Darian Grubb called for a spring rubber adjustment during the team’s first stop to help a tight condition on the right-hand turns. The car came to life during the race’s midpoint, with Hamlin moving into the top-10 just before his second stop. However, the engine let go in the #11 machine and forced the team to retire from the race. The finish dropped Hamlin two spots to 10th in the NASCAR standings following Watkins Glen, 84 points behind new leader Jimmie Johnson after 22 of 26 regular season races. The Series returns to Michigan International Speedway on Sunday for its second 400-mile race of the season at the two-mile track. In the June event at MIS, Hamlin finished 34th, forced to retire earlier following an on-track incident on Lap 132 (of 200) and subsequent fire under the #11 FedEx Office Toyota. The incident occurred on the first lap of a restart, when cars were four-wide into Turn 3 and Hamlin was nudged from behind in the left-rear by another competitor, sending him spinning into the infield grass that caused left-side damage to his race car. As Hamlin drove to pit road for repairs, a fire erupted underneath the car, and he stopped before safely climbing out. 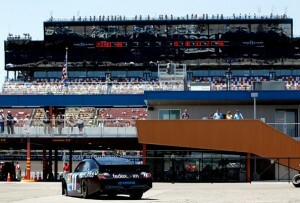 Hamlin owns a pair of victories at Michigan, winning back-to-back June events in 2010 and 2011. The 31-year-old Virginia native has seven top-10 results in 13 events at the track. The FedEx Office location the convention center in Atlanta will be recognized with its “1065″ code numbers on the b-post of the #11 FedEx Office Toyota this weekend in Michigan. What are your thoughts heading into the return trip to Michigan this weekend?